Stone tools and other items from ancient sites in Kenya give a glimpse at the emergence of some key human behaviors, perhaps including a building of relationships with distant neighbors, new research says. Scientists can’t be sure whether the objects were made by our species, Homo sapiens, or some close relative that’s now extinct. But at about 320,000 years old, they’re roughly the same age or a bit older than the earliest known H. sapiens fossils, which appeared in Morocco. In any case, they show “foundations of the origin of modern human behavior,” says Richard Potts of the Smithsonian Institution, one of the researchers reporting the find in three papers released Thursday by the journal Science. The tools are much smaller and more sophisticated than the older, teardrop-shaped stone tools found in the same area in southern Kenya. Some were made of a volcanic rock, obsidian, that didn’t come from the area, meaning the toolmakers traveled miles to get it. And those excursions must have led them to encounter groups of H. sapiens or our close evolutionary relatives. The toolmakers likely made connections with them so that they wouldn’t be threatened when they showed up on somebody else’s turf, the researchers said. “I don’t think you would last very long if you went around grabbing someone else’s obsidian without their permission,” said Alison Brooks, an anthropology professor at George Washington University in Washington, D.C., and another author of the papers. 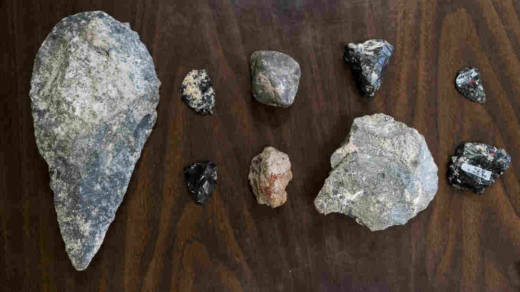 The newer tool style, known from other sites as Middle Stone Age technology, produced smaller stone flakes for uses like scraping and points on projectiles. It required a lot more planning to break off those chips to a desired size and shape, and so indicates a level of mental sophistication, Potts said. The findings include some small stone points that were carefully modified at the base so they could be attached to something like a spear. Potts stressed that the researchers don’t claim that they’ve identified the birthplace of this tool style, but rather that the finds represent what was going on in at least one part of Africa. The older stone tools are from 1.2 million to about 500,000 years ago. Then, because of the geology of the sites, nothing is preserved until 320,000 years ago, when “we have a total replacement” of the old tool style by a more advanced one, Potts said. Analysis showed much of the obsidian was from places about 15 miles to 30 miles away in five different directions. So that means the toolmakers maintained mental maps of where to go find it, Potts said. The volcanic rock was brought in as a raw material, and then turned into the sharp-edged chips. The rock was evidently valuable, and so it might have been traded, Potts said. He also said the toolmakers may have been spurred to create a wide-ranging social network as a hedge against the unpredictability of water and food supplies, caused by shifts in the natural environment. “Networks are the way that hunter-gatherers protect themselves against disaster in the future,” said Brooks. The researchers also reported finding evidence for use of pigments. Two rocks appeared to have been ground and chopped, evidently to produce a powder of the bright red ochre pigment they contained. Some other rocks brought in from elsewhere contained manganese, which has been used in other archaeological settings as a black pigment. The researchers don’t know what the toolmakers may have colored, but in other settings the use of color is often “something that is basically advertising that you’re part of a group,” as with flags or uniforms, Potts said. Experts not connected with the work called it significant. The three papers “lead us towards a more nuanced understanding of our species’ origins,” said Sarah Wurz of the University of the Witwatersrand in Johannesburg. A key advance is tying the appearance of the cultural changes to evidence of environmental changes, such as rapid wet-dry cycles, she wrote in an email.